As Christians we believe that the family is very important to the Christian life (Exod. 20:12, Ps 127, 128, etc...). Thus in my book I mention how a move towards a more family based culture of food is needed. But I thought I would also add that not only are there times to eat at other family's houses, but also at restaurants. I believe there is a place for restaurants in a Christian culture, although our current view of restaurants needs some reforming. Basically when eating at home you are having fellowship with family. When eating a potluck after church you are having fellowship with your church. When you are eating at a restaurant in a community, what makes this different than normal is that you are having fellowship with your local community. Many of us, though, do not take advantage of this opportunity to be a community at restaurants but hide in our own corner. My family moved a year and a half ago from Missouri to Colorado, and after moving we haven't gone out to eat as much as we used to; part of the reason being that we live farther out in the country near a small town. Instead we have really enjoyed Saturdays when we will often to the local coffee house where my mom and I will played music and the family will get to know many of the locals and regulars from the area. After doing this for a while we are making friends in the community and do the culture of music and food in relationship with real people. This is great! And then we will sometimes go to our favorite Mexican restaurant across the parking lot from the coffee house for lunch or dinner and see our friends over there, sometimes running into friends from church, or people we just saw at the coffee house. Most Americans do need to eat more at home. It's more affordable, it builds very valuable relationships, it's almost always healthier, etc... But when we do eat out in the community I think we need to examine how and why we are doing so. 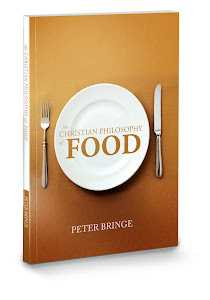 When used in moderate amounts, eating out can be used to the glory of God and for outreach of Christian culture and life into your mini-nation. I need to think about it some more, but here's a start. Your thoughts? Where you live sounds pleasant. I love small towns. I also enjoyed the videos of you and your Mum playing at the coffee house; good idea! Live music is the best. By the way, I loved your rendition of ''Flowers of Edinburgh; the 'flute' you played made it sound especially good. I agree with what you said about restaurants; our family always enjoys excursions to a favorite restaurant, but on account of the size of our family, we limit those times to once or twice a year. (usually when we are travelling somewhere.) And although restaurants have this timeless excitement about them, we usually agree that home-cooked meals (especially the gourmet meals we prepare for special occasions!) are the BEST! 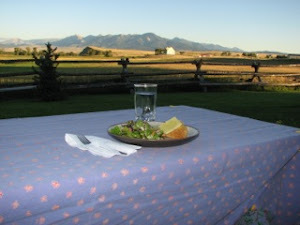 I've been long interested in the topic of food and faith and how they intersect, and am happy to have found your blog. I agree with your comments about how we should harness our eating out for the glory of God, and eat in more. I've recently married and one of the things we try to do is have guests in our home as much as possible, rather than inviting them to eat with us at a restaurant. I think we are much more able to direct the spirit/environment of the evening, serve healthier food, save money, etc. Anyway, thanks for all your thoughts on this!